The three-time Atlantic League champion Long Island Ducks today announced that the Waddle In Shop, the team’s official merchandise store, will re-open for the holiday season on Saturday, December 5 at 10:00 a.m. The shop will remain open through Tuesday, Dec. 22 with hours Monday through Friday from 9:00 a.m. to 5:00 p.m. The Ducks have also announced the return of their Black Friday “Cyber Sale” which begins Friday, November 27 at midnight and lasts throughout the day! Anyone purchasing Ducks apparel online will receive 20% off their total purchase simply by typing in the promo code “BLACKFRIDAY” at checkout. 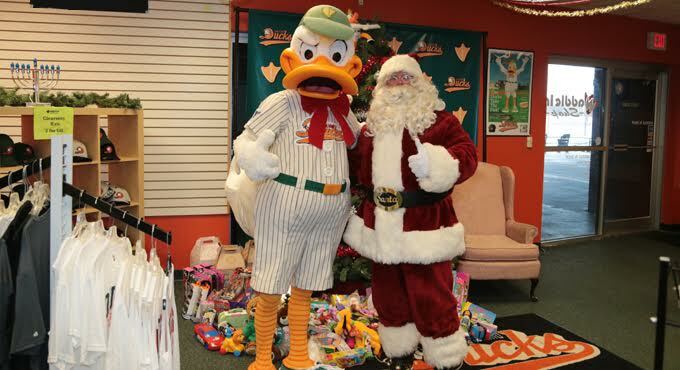 The holiday shopping kickoff on Dec. 5 will feature visits from QuackerJack and of course, Santa Claus! In addition, Ducks manager Kevin Baez and pitcher Bruce Kern are scheduled to be in attendance. Fans will be able to browse a wide range of official Ducks merchandise, including BRAND NEW winter apparel, knit hats, t-shirts, polos and novelty items. There is something for each and every Ducks fan in your life, so be sure to stop by and enjoy the festivities. The Long Island Ducks are members of the Atlantic League of Professional Baseball and play their home games at Bethpage Ballpark in Central Islip, N.Y. For further information, call (631) 940-DUCK or visit www.liducks.com.